I often get asked how I design knitting patterns. It's a very broad question that's hard to explain. The process depends on a variety of factors. 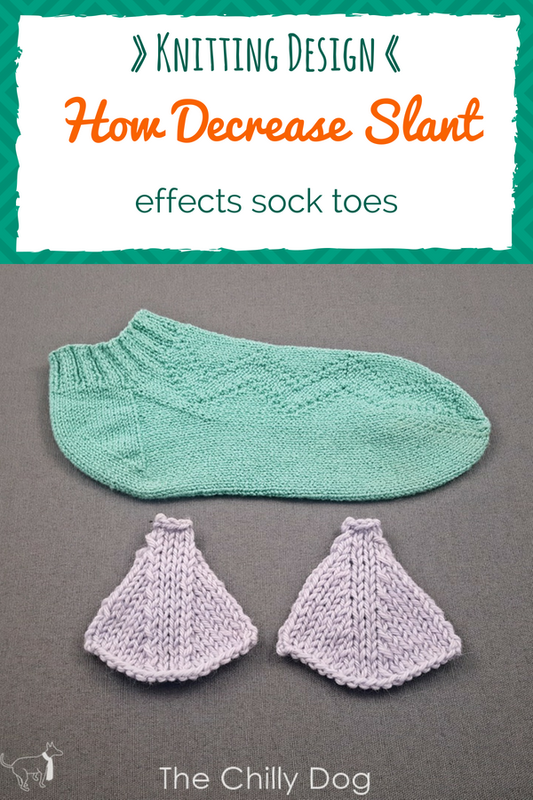 Instead of going into the entire process, I'll give you a peek at my latest design, my Switchback Socks, and how I chose one specific aspect of the pattern, the toe shaping. These socks are knit from the cuff down with a zigzag cascading down the side of the socks. 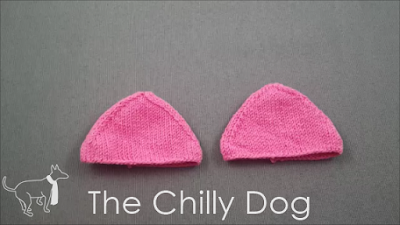 Since the zigzag is the prettiest feature of the sock, it was important to me that it remained visible, without interruption, down the entire foot and toe. Therefore I chose to use a (rounded) wedge toe that uses paired decreases at the sides of the foot. The big question was should the decreased stitches slant toward or away from the side of the foot. 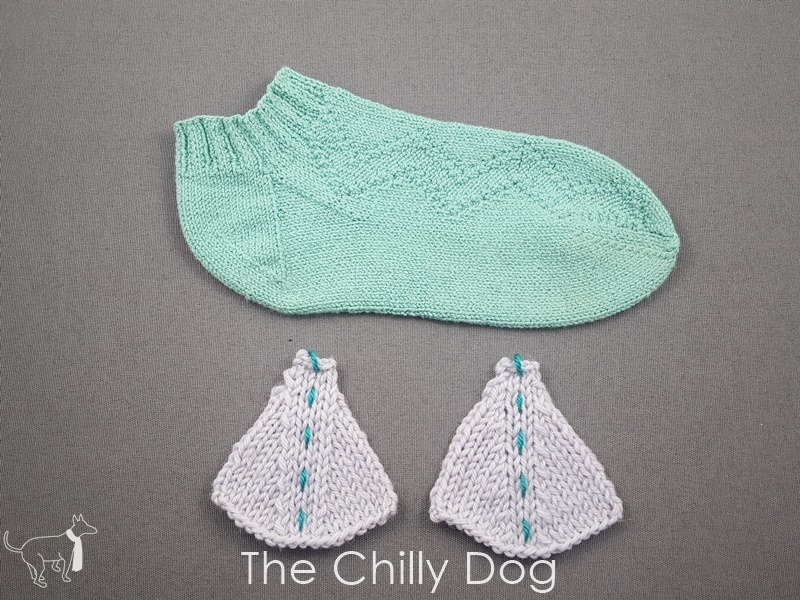 Here are two sample sock toes. Both are rounded wedge toes. The toe on the left uses decreases that slant away from the side of the foot. The toe on the right uses decreases that slant toward the side of the foot. When you're looking straight down at the toes, the overall shaping is the same for both. From the side, the toes are noticeably different. It's even easier to see the difference if you look at flat swatches. Imagine that those gray triangles are the side of the toe and the blue dotted line is running down the side of the foot parallel to the ground. Again, the swatch on the left uses decreases that slant away from the (dotted line) side of the foot and the band is wider. 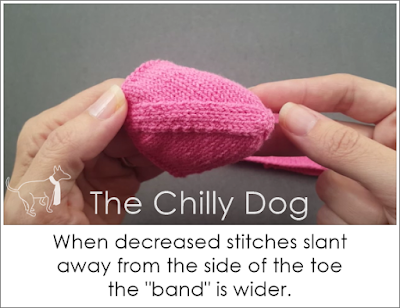 The swatch on the right uses decreases that slant toward the (dotted line) side of the foot so the band is narrower. As I said earlier, I wanted the zigzag stitch pattern to be the star of the show. I chose to shape my toes using paired decreases that slant towards the side of the foot to make the band less conspicuous. If you'd like to make a pair of Switchback Socks, the pattern is available in my shop. 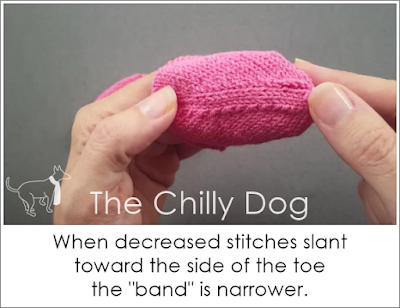 Knit Design choices: SSK and K2TOG...Learn how the slant of decreased stitches impacts the look of a wedge sock toe.